Paralympic gold medalist Summer Mortimer visited Buchanan Park Elementary School Friday to share her story with some eager fans. Four-time Paralympic medalist Summer Mortimer visited students at Buchanan Park Elementary School. She told the kids you can do anything if you have a positive mindset. Summer Mortimer smiled as she placed one of her Paralympic medals around four-year-old Charlotte McElroy’s neck. "I like your wheelchair. It’s pink. My wheelchair was just black," she said as McElroy beamed back at the gold medalist swimmer. The four-time Paralympic medalist stopped by Hamilton’s Buchanan Park Elementary School Friday to share her story. Four years ago, when Mortimer shattered her feet in a trampoline accident, doctors said she might never walk again. They even considered amputation. "I didn’t know that at the time," Mortimer said, speaking in front of the gym full of awestruck students. "My parents only told me that last year. I wasn’t too happy when I heard that." Instead of amputation, the Burlington teen fought to walk — and swim — again. Surgery left her with metal plates and pins in her feet, as well as constant pain, but she wouldn’t let anything stand in the way of her lofty goals. 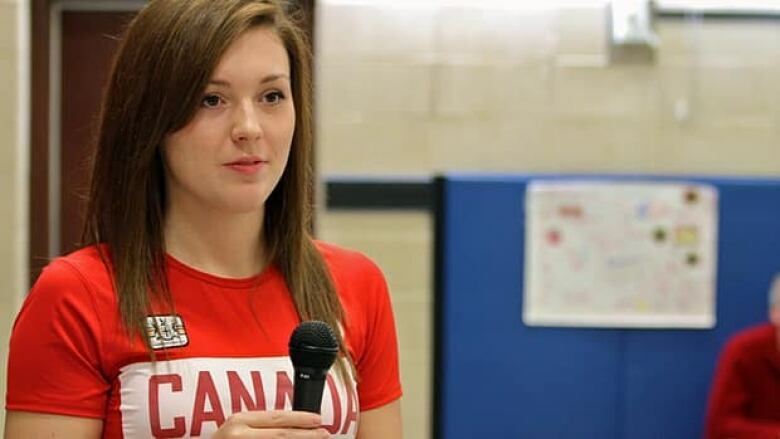 A competitive swimmer since the age of nine, she was on track to compete for Team Canada at the 2012 summer Olympics before her accident. Instead, she represented Canada as a Parathlete. Many predicted she would return home as the most decorated of all the Canadian Olympians — including the able-bodied competitors — and she did. "It was a lot of pressure," the 19-year-old said. "I just focused on being happy with my technical performance, rather than focusing on the medals." But once she arrived in London, the energy from the crowd made her want to push herself, she said. "Walking into the pool was like walking into a concert," she said. "Except you’re standing there in your bathing suit." After winning two golds, a silver and a bronze medal — not to mention crushing her own able-bodied world record — it’s safe to say she exceeded everyone’s expectations. After the short speech, several children lined up to ask Mortimer questions, which she answered candidly. When one student asked how she felt after winning her first gold medal, Mortimer responded with an enthusiastic "woo hoo!" She happily shared her medals, letting the children hold and examine them, as she smiled for photos and signed autographs. The 19-year-old Westmount graduate said she enjoys giving back to the community, especially children. "They inspire me," she said. "I’m here to teach them that you can do anything as long as you have a positive mindset." Now living in Ancaster, Mortimer is taking some time off to focus on her health — including getting more overdue surgery on her feet — before looking ahead to the 2013 Paralympic swimming world championships, the 2015 PanAm Games, and the Rio Paralympic Games in 2016. "The Paralympics made me realize that I have so much further to drop (in my times)," she said. "So, I’m really excited for Rio. That’s my main focus."